Choosing an engagement ring and preparing for the big proposal is an incredibly exciting time in one’s life. Remember, though, that a ring is also one of the most significant purchases you’ll ever make, so you want to make sure you do it right. An engagement ring should be uniquely meaningful and complementary to your partner’s personal style. Although these may seem like incredibly high expectations for a single piece of jewelry, you should have no trouble finding a ring that meets these important criteria—if you know where to look. When searching for such an important piece of jewelry to commemorate one of the most significant milestones in your life, it’s easy to feel overwhelmed. However, learning about different diamond shapes and engagement ring styles will help you sort through the myriad options, until you find that perfect ring. Whether you’re going it alone or shopping with your partner, this guide will help you do just that. The round brilliant has historically been the most popular and familiar diamond shape when shopping for an engagement ring, but there are numerous other options. 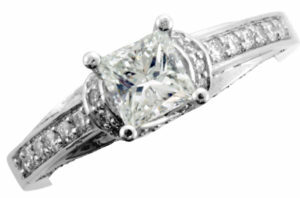 You may have heard of ‘princess cut’ or ‘pear-shaped’ diamonds, among others. Choosing a unique diamond shape is a way to ensure that your ring will be just a bit different from everyone else’s. 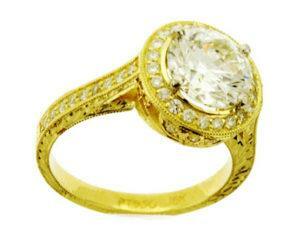 Below are some popular shapes that you may wish to consider for your engagement ring. As round diamonds feature the greatest number of facets and therefore the best ability to reflect light, they enjoy the reputation of being the most ‘sparkly’ of all the diamond shapes. 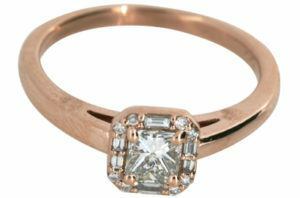 Princess-cut diamonds may be square or rectangular, and feature sharp edges. This shape is equally suitable for a classic Art Deco design or a contemporary geometric mounting. 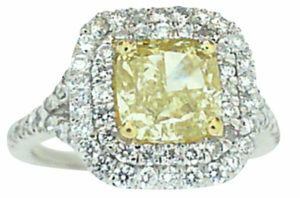 As its name implies, the cushion-cut diamond resembles a pillow. 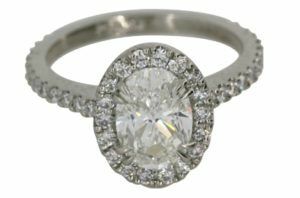 This shape offers excellent brilliance and the unique profile of a softly rounded square or rectangle. Emerald-cut diamonds are step-cut and feature large, elongated facets. More than other shapes, good clarity is important in emerald-cuts, as imperfections are more visible in the mirror-like facets. Oval shaped diamonds have seen a remarkable resurgence in popularity with women who are looking to update a classic silhouette into a modern, trendy design. The classic solitaire setting features a single diamond prominently set in the center of a slender band, with either four or six prongs holding the stone in place. 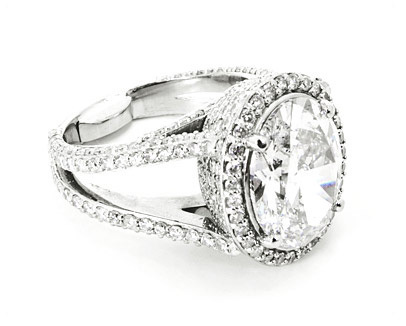 A halo setting highlights a center diamond by surrounding it with a border of smaller stones. 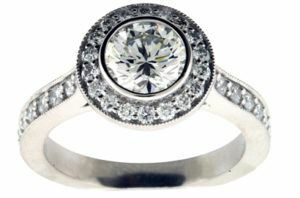 This popular style enhances the center stone by making it appear larger, and adds considerable ‘dazzle’. 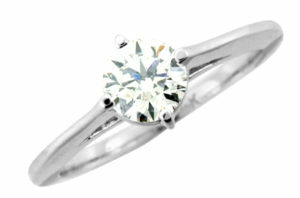 The trilogy is a three-stone setting, featuring a center diamond or gemstone flanked by two smaller gems. 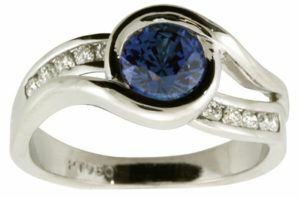 This style is ideal if you want to add a touch of color, such as ruby or sapphire, to your engagement ring. Pave bands feature small, deeply-set stones surrounding a center stone. For an all-over-sparkle effect, pave is a perfect choice. 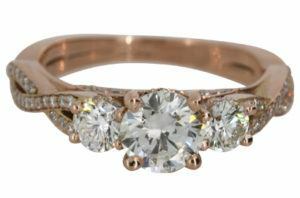 An increasingly popular style, vintage settings are often beautifully embellished with ornate engraving or edged with delicate milgrain for an antique-inspired look. In this style, the diamond is nestled in one or more swirls of precious metal, lending the setting an organic, feminine element. You likely have heard of the ‘Four Cs’ when describing diamonds: Cut, Color, Clarity, and Carat weight. The cut is the most important of these elements because it has a significant impact on the way your diamond reflects light. You may choose a diamond with excellent color and clarity, but a poor or fair cut grade may result in a diamond that doesn’t sparkle the way you had hoped. Many people incorrectly assume that diamond cut and shape are synonymous, but they are quite different. The cut is related to the diamond’s facets and angles, and whether they are properly proportioned and symmetrical. If your diamond is cut too shallow, light entering through the top of the stone will escape out the bottom, while a too-deep cut will allow light to escape through the sides. By contrast, a correctly cut diamond enables light to bounce around the facets and return it to your eyes, creating that much-desired sparkle. Whether you’re ready to choose an engagement ring or are still unsure about the right diamond shape or setting style, Dominion Jewelers in Falls Church, Virginia is here for you. Our experienced, friendly team can guide you through our extensive array of highest-quality designer diamond engagement rings. We can help you discover a world of different styles and learn everything you care to know about diamonds, colored gemstones, precious metals, and more. In addition to our impressive selection, we also offer the option to custom design and create a ring that is uniquely yours. If you can’t find a ring to fit your vision, let us help you make your partner’s dreams come true with a one-of-a-kind creation. To learn more about our collection of diamond engagement rings, or to plan a visit to our beautiful showroom, contact Dominion Jewelers today.